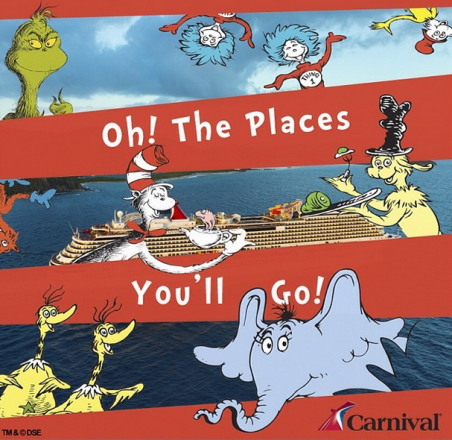 Carnival Cruise Lines Announces Seuss at Sea Program for 2014! One ship, two ships, it’s Dr. Seuss on cruise ships! Carnival Cruise Lines recently unveiled an exclusive partnership with Dr. Seuss Enterprises to bring the beloved children’s brand and favorite characters to the line’s fleet of 24 “Fun Ships.” In an industry first, the Carnival Seuss at Sea program will offer a variety of exciting and immersive onboard youth, family, dining and entertainment experiences featuring the amazing world and words of Dr. Seuss. “It is fun to have fun but you have to know how,” said the Cat in the Hat in the iconic Dr. Seuss book. The fun on Carnival starts in the main dining room during The Green Eggs and Ham Breakfast with the Cat in the Hat and Friends. Attendees will have the opportunity to kick off their day dining on playful foods straight from Dr. Seuss’s imagination – green eggs and ham, moose juice and goose juice, along with colorful fruit and pancake stacks, funky French toast and more, with traditional breakfast favorites also available. While Carnival’s wait staff set the tone with Dr. Seuss-inspired uniforms, popular Dr. Seuss characters such as the Cat in the Hat, Thing One and Thing Two, and Sam will be joining guests at their tables for fun interactions and one-of-a-kind photo opportunities. Hosted on the first sea day of each cruise, this special breakfast will be available for $5 per guest.